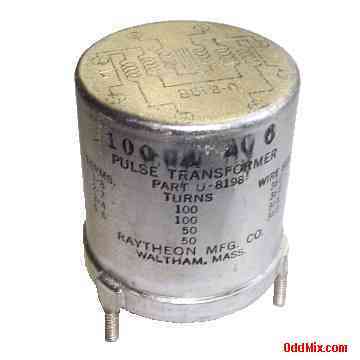 This magnetically shielded pulse transformer assembly was made by Raytheon Mfg. Co. for the US Navy. It is a quality component with many other uses in the home laboratory. It has four windings. Two of them 100 turns, and two 50 turns, all made with 36 gage wire on quality iron core. All five transformers are unused and in excellent condition. On some units, the originally shiny tin surface of the enclosure has turned a bit dull in color. The robust design and sturdy construction makes this transformer assembly practically indestructible. For a replacement part, special hobby projects, or other applications this shielded transformer assembly would be a good choice. It is hard to find surviving new transformers in this nice condition. Five available.